Comfort : Best Fashionably Comfortable Hoodies that you have wore till now, Fabric is so soft over the skin. High Fashion rich culture black look will get just teaming up with washed jeans. It has a sleeve pocket in case if you use this sweatshirt for jogging you can keep your mobiles or music player in the sleeve pocket. Fabric: 100% Pure Cotton ; Premium Export Quality Branded Full Sleeve hooded sweatshirt ; Unique Collection to your wardrobe casuals a hit of effortless cool with this best looking t shirt. Sleeve Pocket is made of Black Denim fabric. 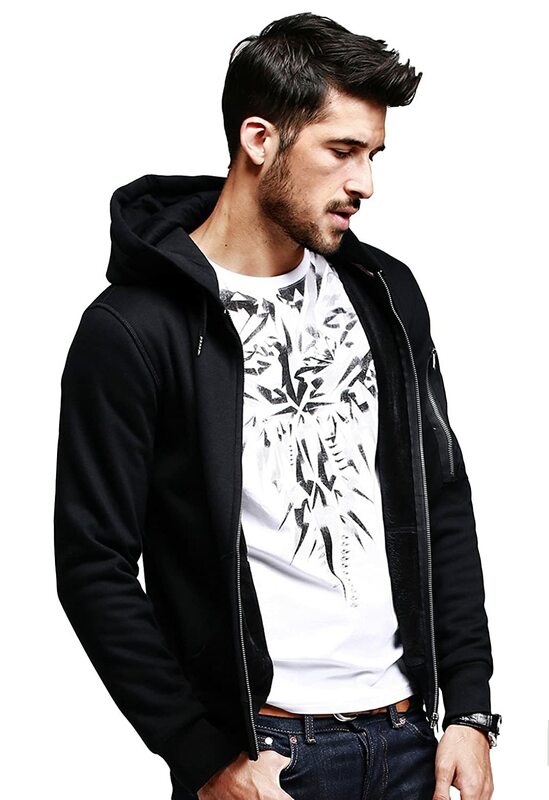 Sleeve Type: Full Sleeve; Neck type: High Neck T-Shirt; Hooded : Yes, Hooded Sweatshirt ; Pockets : Front Kangaroo Pocket, in Sleeves fashionable pocket which made of Black Denim fabric ; Style: Fashionable Hoodie jacket. Perfect for Trending Stylish Look for Company Outs as well. Simple and sophisticated look it will bring on. Perfect for Jogging, Winter wear, Night High ways long drive. Note: Check the Size chart to get Perfect fit for you! Shirt size 36 can go for S, 38 can go for M, 40 can go for L, 42 can go for XL. If you prefer wearing inner shirt and wear this hoodie outside, we suggest go for one bigger size than your regular size. Quality: All garments are subjected to the following tests Fabric dimensional stability test and quality inspection for colours and wash fastness. To maintain the collar please dry the hoodie with hanger for longer durability of the neck rib. Dry in shades. Usual Machine wash or Regular wash is preferable.